Our accommodation plan to (re) Discover Australia is three-fold: Camping when and where we can. Housesitting. And, when needing to, staying in Airbnb’s. As much as we love to camp, sometimes a bed and our own shower is required. I hate camping in wind and in the rain. I will stay up all night fretting about every little thing. And, as much as Rich loves the outdoors, he gets cold – fast — shivering to the bone cold. Then there is AirBnb when the weather doesn’t cooperate to camp or we’re just looking to stay somewhere unique for a few days. We can catch up on writing, or more importantly, on washing the clothes. 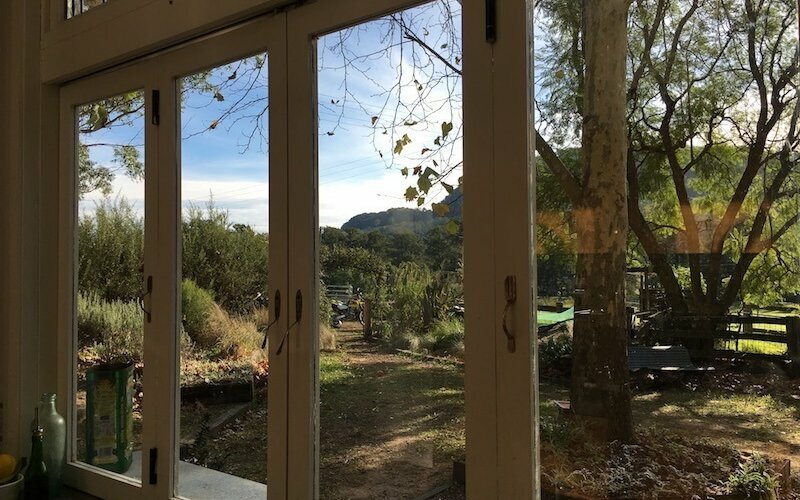 The question we’ve been asked: Why did we choose Airbnb over staying in hotels? They generally have more space. After being in a car all day together is a welcomed respite. Many include the makings for breakfast, which helps keep our costs down. Wi-Fi is often available which is handy for us as digital nomads. Some offer a washer/dryer keeping costs down on the road. Laundromats charge a fortune for a load of laundry in Australia. We’ve paid $20 just to do a load of laundry before. Of those that offer a washing machine, they usually include laundry powder and if not a dryer, a drying rack or line to dry. AirBnbs, for us, are more cost effective. We’ve found them to be cheaper than staying in a Holiday Park cabin or villa, and often, much cheaper than a hotel. To date, AirBnb has worked out well for our travel plan. We’ve had only two minor glitches in the last 6 weeks of travelling which, considering how many AirBnbs we’ve stayed in, is minor. We’ve had more issues staying in hotels. 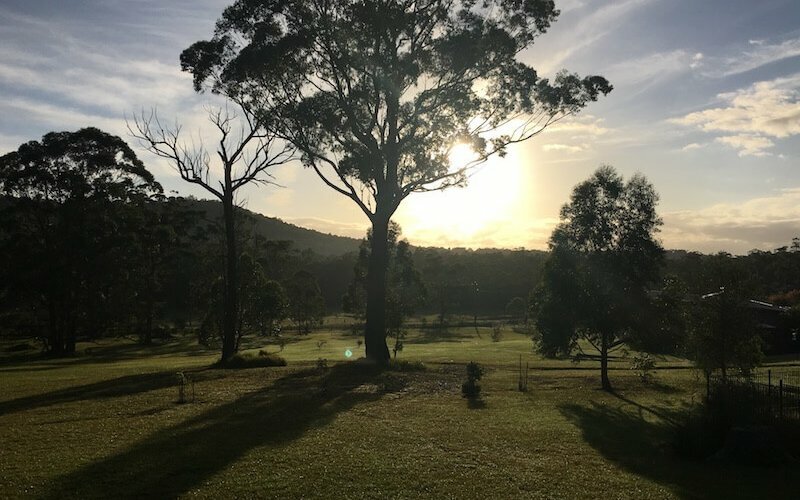 Broger's End, Kangaroo Valley, N.S.W. Funky Wild West – Hunter Valley, N.S.W. Funky it was. 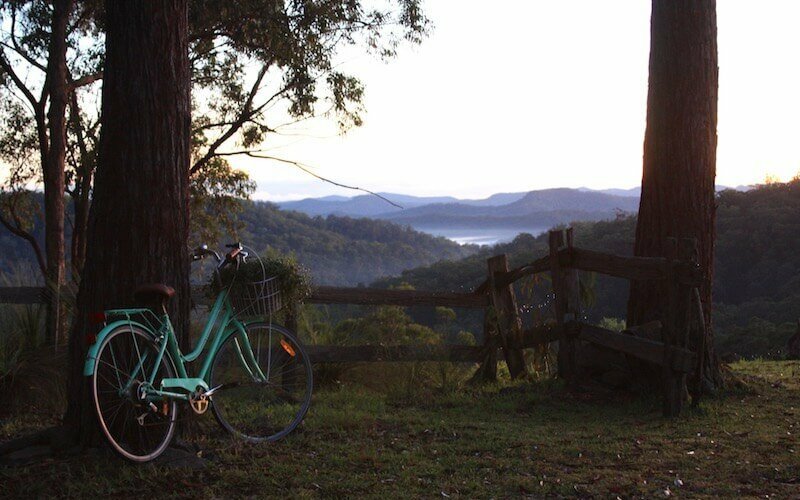 This unique place was nestled into the Hunter Valley hills, accessible to the famous Hunter vineyards. The surrounding area offered amazing drives. The stories behind this place captured us most. It was owned by an ex – tour manager and his interior designer wife. Richard Marx and Tina Turner were amongst his clientele. Rock and Roll memorabilia and a flair for the American Southwest decorated the walls. Everywhere you turned, there was something different to discover. 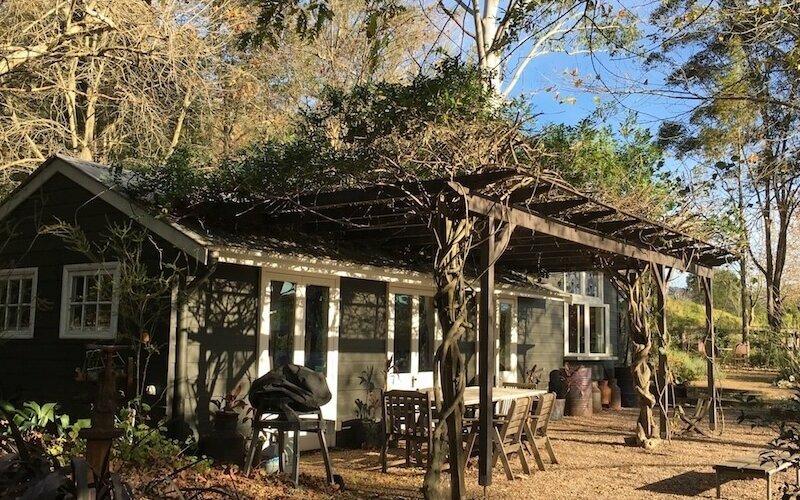 Best of all, this place had everything you want for a true weekend escape: A roaring fire pit, a full kitchen, comfy beds, and additional guest rooms which were converted caravans connected to the house. Best of all, it boasted amazing views overlooking mountains from the large deck. Funky Wild West. Also known as Walker's Run. Hunter Valley, N.S.W. This was one of my favourite places to stay. Maybe because it was a self-retreat, but even so, I could picture myself living in a place just like this later in life. It had a wood fire in the centre of converted dairy shed, a large bed at one end (sectioned off by heavy curtains if you wished), a full kitchen separated with a serious coffee machine, windows that folded back to bring the outside in and an eco-friendly bathroom with rain-shower head and outside bathtub. Outside was a large picnic table under a trellis that overlooked the farm. Farm fresh eggs from the free range ‘girls’ were some of the best I’ve ever tasted. 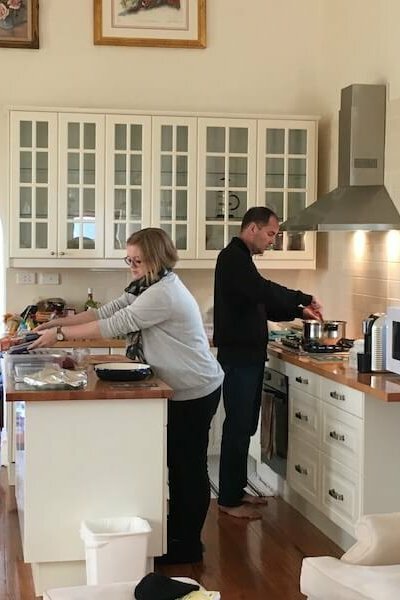 Belconnen Apartment – Canberra, A.C.T. This was the first place we stayed in Canberra when we first settled our daughter into University. It was conveniently situated with the Westfield Shopping Centre across the road. Supermarkets, restaurants, and even a cinema was a short walk across the street. The apartment was spacious with an open living/kitchen plan, a separate bedroom, and a bathroom down the hall. And, although we shared the laundry with the next-door neighbour, it was available whenever we needed it. 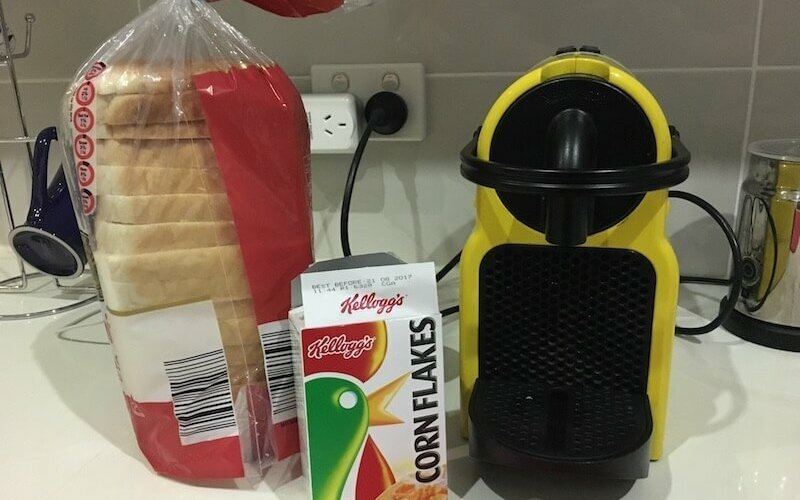 It offered modern conveniences, including a clothes steamer to get the pesky wrinkles out for Canberra social events. The 6th floor unit offers views over the lake and the plentiful windows let you see the weather roll in. Juice boxes and chocolate snacks were a delightful treat, as was the easy-to-use coffee maker. Price a/o April 2017: $AU under $100/night. Litos Place – Canberra, A.C.T. 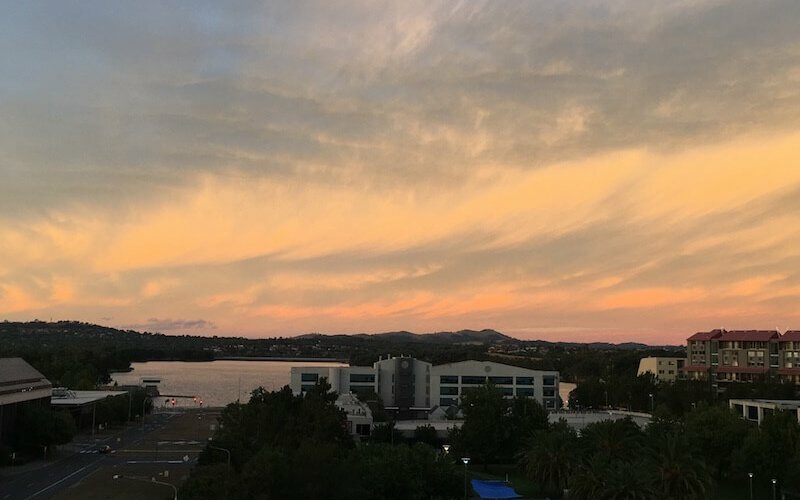 A few weeks later we were back in Canberra kicking off the first destination on our [10-month road trip]. We chose a place central to the University so spending time with our daughter would be easy. This place was within walking distance to shopping, restaurants, and easily accessible to the Parliamentary Zone, where the museums are located. We had Wi-Fi to get work done, a washing machine to sort out our washing and a full kitchen to keep our costs down. Spacious, convenient and cheap! Breakfast supplies and a good coffee maker kept us happy. Price a/o April 2017: $AU 82/night. Goodies provided at Lito's Place. 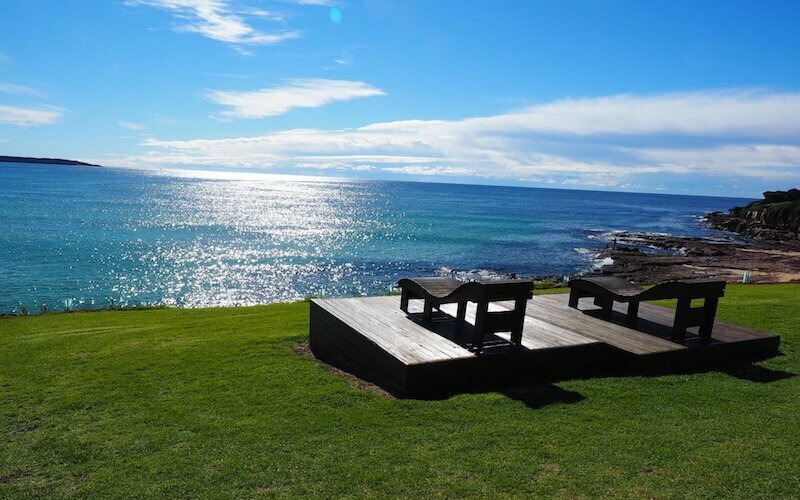 Bush Retreat Near the Beach – Jervis Bay, N.S.W. When driving up to this AirBnb, it didn’t look like much more than a shed on the back of a property. But once we walked in, the place completely surprised us. It was a converted shed with modern conveniences, including a full kitchen, a washing machine to sort the laundry, and an amazing bathroom. Situated on a 5-acre property, we experienced plenty of the bush, but when we needed a beach fix, it was only 15 minutes away. And, it just happened to be Hyams Beach, one of Australia’s best. We were welcomed by the owner’s dog Teddy, who was a totally lovefest on furry legs. He was smart too. When we needed to get stuff done, we told him to go home and he did. This place was really relaxing. It had a bunch of DVDs on offer, breakfast supplies to keep us going for days and wallabies who came into the house paddock to hang out with us each evening. 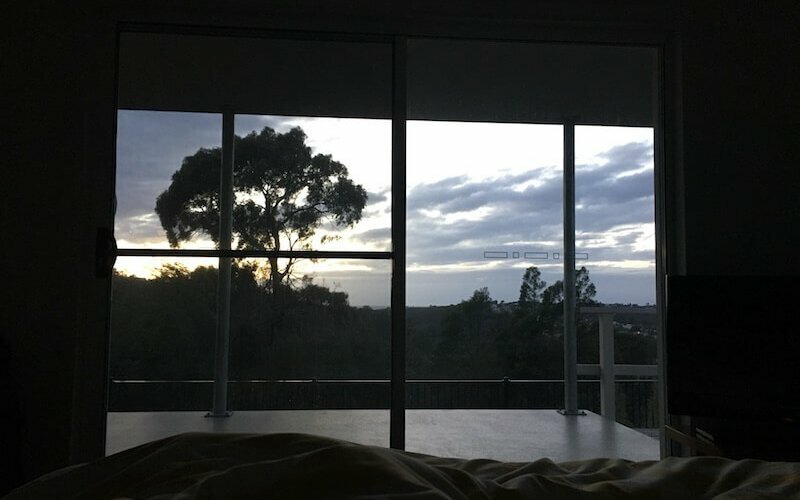 Annie’s Apartment – Merimbula, N.S.W. We preferred to call this The Turtle House. This apartment in Merimbula blew us away. As soon as we walked in, we had visions of staying forever. Nestled on a hill in a residential area, you followed a path down the side of the house to the entrance of the apartment. On the large deck, we found sensational views overlooking the town and ocean. This apartment also had wonderfully soft linens (Ovela brand sheets) and a soothing rainfall showerhead. The kitchen wasn’t considered a full kitchen (i.e. no oven), but it had a panini press and jaffle maker to make things interesting. My favourite part, the kitchen was outfitted with logical supplies to cook with. The outdoor patio hosted a BBQ to extend the kitchen and a long outdoor table to enjoy the views. Annie was a lovely hostess who provided breakfast supplies to get us going in the morning. She even dropping off some fresh panini rolls she’d picked up locally for our last morning. Price a/o April 2017: $AU 98/night. Merimbula view from the bedroom. This accommodation was created from a restored church originally built in the 1880’s. It’s offered as a snowy mountains retreat. No doubt this retreat is booked out in winter, as ski fields aren’t too far away. We visited over the Easter long weekend. Gorgeous sunny blue skies during the day countered the cold, frosty nights (3 degrees C on average). That meant we could enjoy the indoor wood fire every night which warmed the cavernous space. The Church has taken its owner 6 years to restore and he’s done it beautifully. It has a comfortable, full kitchen to cook in and a cosy and comfortable bed. This is a nice spot to be a while. This is a remote spot – population only 230 – but it expands with tourists during the winter season and for the Easter weekend due to the festival. There’s great fishing and camping here all year long as well. 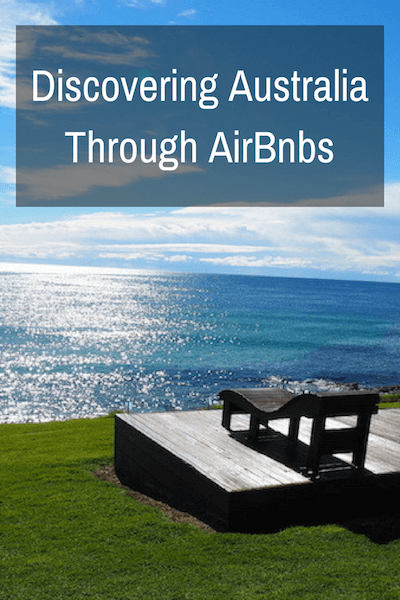 We will be adding to this list as we go, but if you have a unique AirBnb in Australia, we’d love to hear about it. Share the link below and we’ll check it out. BONUS: If you’ve never tried AirBnb before, click here for a credit for your first stay! Previous Post Travel Journal: A Week At The Beach.